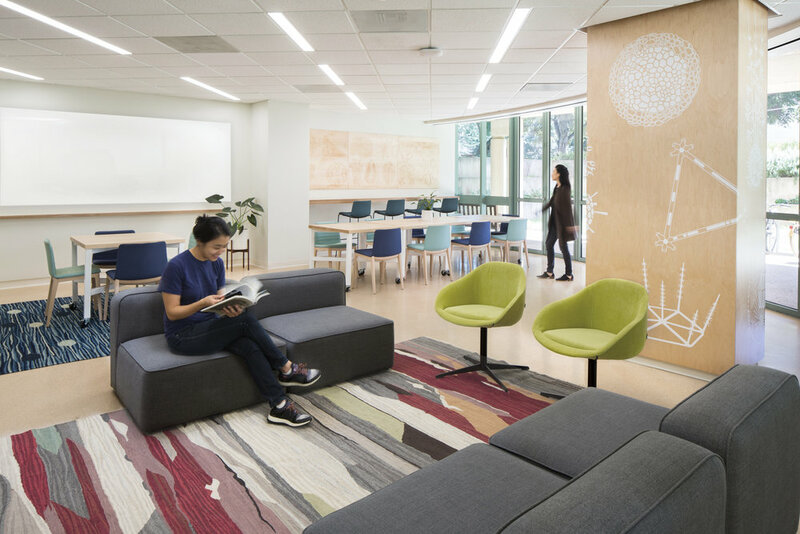 Working closely with a group of students and faculty at Stanford, we transformed an under-utilized and outdated classroom into a vibrant and dynamic undergraduate lounge. Using warm materials like cork, wood, and wool, and a welcoming palette of natural shades, we designed the space to encourage students to linger, collaborate, and dream up new projects. Drawing upon motifs from biological drawings, we designed carved wood art panels, bold mega-graphics, and playful handmade rugs that use imagery of cells and organisms. Custom furniture allows the space to be reconfigurable for small group work and large events, and varying seating types encourages multiple modes of work. The curved window wall was reconfigured to fully open to the outdoor patio, breaking down the boundary between the interior and exterior.